On Sunday, I did a Yoga Mala, which is 108 sun salutations done in a row. This particular Yoga Mala was a fundraiser I did for lung cancer research. 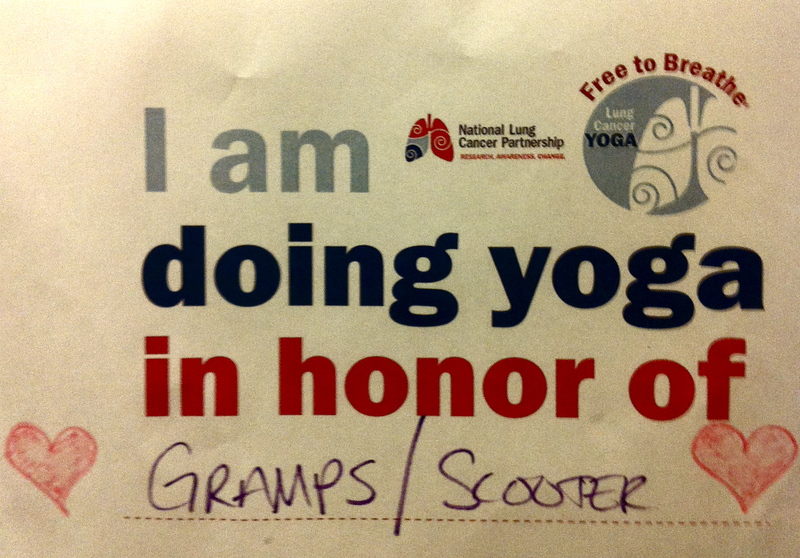 My grandfather died in August of lung cancer. Yogis call a fundraising Yoga Mala a Yogathon, like a marathon. In today’s post, I am sharing pictures from the Yogathon. Also, below is an explanation of a sun salutation and why we perform 108, as well as remedies to combat muscle soreness from overexertion. My sign dedicating my 108 sun salutations to my grandfather. A sun salutation is a sequence of 9 breaths. In Sanskrit, a sun salutation is called Surya Namaskar. There are many variations of sun salutations, but below is the sequence we practiced 108 times in our Yogathon. 108 sun salutations sounds like a lot of work. Yes, it is really hard as it sounds. It took about 2 hours and 30 minutes to complete a Yoga Mala with this sequence. A lot of people ask why we perform 108 sun salutations. The number 108 is a sacred number in yoga and in Hinduism. There are many explanations as to why this is. The simplest explanation is that Hindu prayer beads have 108 beads strung together, along with one guru bead. The prayer beads are used to say a mantra 108 times, very similar to Catholic rosary beads. It should go without saying that performing 108 sun salutations will cause overexertion of the muscles. There are several tricks I recommend to people when they have overly exerted their muscles. The first trick I recommend is to eat potassium rich foods after the work out or practice, Some common potassium rich foods are bananas, tomato sauce, avocados, most legumes, and coconut water. Muscles cramp up when they lack potassium, so feeding the muscles potassium will prevent muscle cramping and fatigue. Anyone who has ever worked out too hard, shoveled snow, or performed any other form of manual labor is familiar with muscle soreness and stiffness a day or two after the exertion. This muscle soreness is caused by a build up of lactic acid in the muscles. The first way I recommend combating muscle soreness is to do some light working out. Warming the muscles back up with keep the muscles from feeling stiff, and movement will work the lactic acid out of the muscles. Another trick is to take a warm bath in Epsom salts. Epsom salts have long been used as a remedy for sore, achy muscles. The final recommendation I have is to use a tennis ball or a myofascial release foam roller to massage out the lactic acid in the aching muscles. Some may have seen a myofascial release foam roller in the gym. It is a cylinder-shaped dense foam apparatus that is used to iron out muscle soreness. Personally, I massage my shoulders and arms with a tennis ball, and use a foam roller on my back and lower body to relieve muscle soreness. I used all of these tricks on Sunday after the Yogathon to ease my sore muscles. The next time you have muscle soreness or stiffness due to muscle fatigue, see if these remedies work for you. P.S. 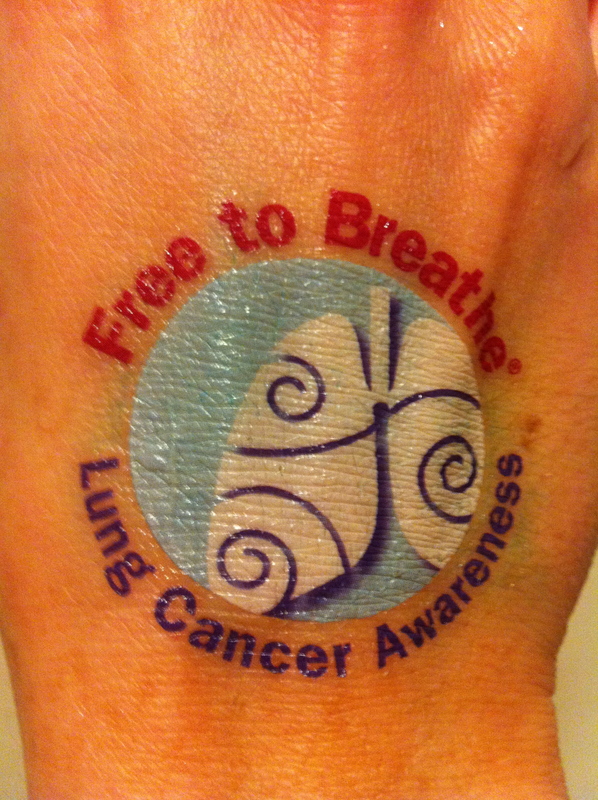 My fundraising for lung cancer research continues through December 31, 2011. If you would like to make a donation, please click here. Thank you for your consideration to help fund research and to raise awareness for the number one killing cancer in America. Remember, not everyone who gets lung cancer is a smoker, but lung cancer research is the most underfunded cancer in the country because of that stigma.